The solution is simple to create desktop shortcut in Windows 10 for a program for a Quick access eg start from the Windows 10 Desktop or add / pin to Start-Menu! In Windows-10 is the fastest way when you open the folder path or open the location of the Program! see: .... find installed program files in windows 10! or .... In Windows 8 will find the program folder! and you have an Internet Explorer shortcut on the Windows 10 desktop (... see Image-1 Arrow 4 to 6). At this point you can also pin the Program on Windows 10 start (... see Image-1 Arrow 7)! 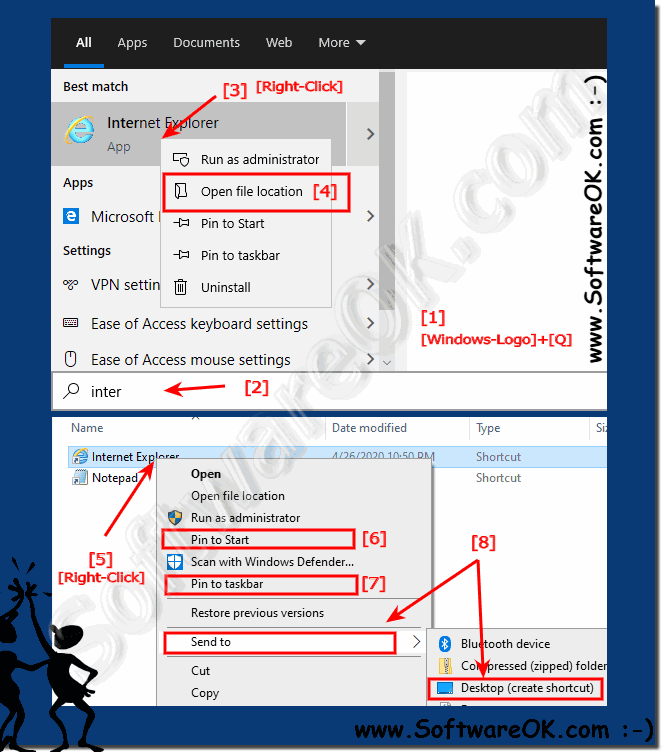 (Image-1) Create desktop shortcut in Windows 10! Windows-10 - FAQ-49: Create desktop shortcut in Windows 10 for a program (ad to Start)?